Earlier this week, my colleague Leah Ludwig and I had the privilege of attending a half-day women’s leadership program led by productivity expert and phenomenal public speaker, Neen James. The event brought together an intimate group of female professionals from a variety of backgrounds to learn how to effectively deliver memorable and impactful presentations. The interactive morning session left Leah and me with a few public speaking and general presentation tips and tactics to keep in mind for upcoming opportunities. • Embrace the strategic “pause” – At important or impactful parts of your presentation, don’t be afraid to pause and let your message sink in. This will help keep your audience’s attention and let them catch up with you while processing the information you have shared with them. They will be on the edge of their seats waiting for your next remarks. 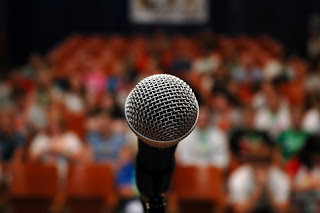 • Use of audience member names – Everyone loves to be called by name whether it is while listening to a great speaker, during a sales pitch or sitting in on a work presentation. Neen provided a few tips directly addressing this topic. If presenting to a small group, ask the event organizer to use table tents with participant’s names, so when interacting with the group, you can use audience members’ names to capture and keep their attention. If you are speaking or presenting for a larger group of people and you don’t directly know anyone in the audience, try to meet a few people beforehand and keep their names in mind – addressing and interacting with these individuals during your presentation. • Move around the platform – Depending on what type of venue or space in which you are speaking or presenting, don’t be afraid to utilize all of it. Neen did a wonderful job of walking around the room when speaking and even “stepping back” when other women leaders were introducing themselves. A good speaker should feel comfortable moving around, but should never forget to stop, stand firm and speak clearly when emphasizing an important point. • It’s not about you – Also, Neen addressed the all too familiar feeling of getting nervous before a presentation or speech. She coached us to keep the focus away from ourselves when preparing to present. Really, it’s not all about the speaker and it’s not all about the audience either. Neen encouraged us to remember that it is all about creating a conversation with the audience. that Also, by remembering that everyone in the audience or in the board room put their pants on one leg at a time, just like we do, will help to banish nervousness when presenting. The morning was filled with many more useful resources for preparing a presentation, tips for audience engagement and techniques for improving public speaking. If you want to learn more, visit neenjames.com.